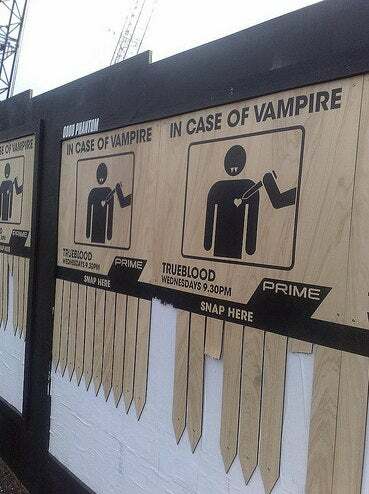 New Zealand's "in case of vampire" posters provide the perfect protection from kiwi vamps. But in other fang news, it sounds like Michael Emerson is a big vamp fan... and he's thirsty for some blood. Carrie Preston, who plays the vamp-hating (but now converted and tolerant) waitress ,talked a little bit about her red-headed character and compared the show to Twilight. Okay, she didn't compare it, the host did. But Preston set him straight: True Blood isn't for horny preteen girls, it's for horny women and slightly older teens, and horny men. But then Preston dropped a bomb, while talking about her guest spot on Lost, giving birth to her real life husband Ben Linus (Yes, she's married to Michael Emerson - swoon.) She mentioned that he loves the show and wants to be on True Blood. Can you imagine? First off, I'm so dedicated to the character of Ben that I don't even think he exists, outside of the reality of Lost. But for him to show up on True Blood, I don't think my brain could handle it. charming, wily, ruthless and wise. With one foot in the old world and one in the new, she rules all vampires in the state of Louisiana, engages with Kings and Queens from other states. Brilliant and far-sighted, she is a consummate diplomat, politician and adversary. Incredibly cultured, has known many of history's most famous people personally - as well as had affairs with many of them - she is entertaining, funny, dangerous and delightful. Sounds like she'll fit in just fine with all the other vampire ladies.